WE OFTEN TAKE STEPS to achieve that sparkling white smile when we brush in the morning and before we go to bed. The truth is, what we consume throughout the day is often the largest contributor to whether or not our smile will light up a room. Although there are several causes for tooth discoloration, we can separate them into three basic categories: intrinsic, extrinsic, and age-related discoloration. Here’s how each affects your teeth, and what you can do to ensure a life full of bright, healthy smiles. Extrinsic tooth discoloration occurs when the enamel—the outer layer of the tooth—becomes stained. These stains are caused by pigments, acidic content, and other chemical factors (natural or artificial) present in things we enjoy eating and drinking. Most of these items won’t have an immediate affect on the color of your teeth, but over time, they can begin to wear away and cling to enamel causing unsightly stains. Try to consume these in moderation and always remember to drink plenty of water and brush your teeth after meals. Here’s a couple of quick tips to help avoid those wine stains! Intrinsic tooth discoloration occurs when the inner structure of the tooth—the dentin—begins to darken or develop a yellow tint. This type of discoloration can develop because of a trauma sustained to the tooth. Sometimes when a tooth sustains trauma during childhood, it can damage the developing permanent tooth beneath it, affecting the tooths color. If a trauma is sustained during adulthood, internal bleeding can potentially discolor the damaged tooth. Other causes include uses of medication at certain stages of life or being born with a rare condition called dentinogenesis imperfecta which can cause gray, amber, or purple discolorations. If you have questions about intrinsic discoloration, come in and see us and we can help answer your questions. Age-related tooth discoloration is a combination of both intrinsic and extrinsic factors. The dentin inside our teeth naturally yellows as we age. Enamel on the outside of teeth also thins as we get older, allowing the yellow pigment of the dentin to show through. A lifetime of consuming certain foods or smoking cigarettes will also contribute to deep-set stains on the enamel’s surface. We know just how important it is to provide our patients with bright, healthy smiles. Each situation is unique and we provide our patients with effective solutions for their unique oral health needs. If you have any questions about your smile’s appearance, let us know in the comments below or call and make an appointment today! Thank you for continuing to be a part of our practice family! WITH ALL THE AMAZING technology we see today, it’s easy to overlook the small wonders of the world—like the toothbrush! This small, but remarkable invention is the staple of our oral hygiene and health. Join us on a journey through time as we explore the way the toothbrush has changed across the ages! Today, we understand the importance oral hygiene plays in our overall health. But even over 5,000 years ago people recognized the need for some type of oral care. Babylonian and Egyptian civilizations around 3500-3000 B.C. made “toothbrushes” by fraying the end of sticks and chewing on them! Later, the Chinese made similar chewing sticks from aromatic tree twigs that were meant to freshen breath. People didn’t just use sticks, however. Bird feathers, animal bones and even porcupine quills were used to pick at food debris in the teeth. The first mention of an actual brush to clean teeth appears in Chinese writings around the 13th century. Bamboo or animal bone was used as the handle of the toothbrush and pig hair formed the bristles. Toothbrushes weren’t widely used or produced, however, until a couple hundred years later. Around the year 1780, an Englishman named William Addis was sitting in his prison cell thinking of better ways to clean our teeth than rubbing them with a rag full of soot and salt (yuck!). He carved a handle out of animal bone, made some holes at the top and tied swine bristles to it. When he got out of prison, he turned toothbrush production into a business and made a fortune! As appetizing as pig hair sounds, aren’t you glad toothbrushes nowadays are made with nylon bristles? Nylon was invented in 1938 and by the 1950s, toothbrushes began to look and feel more like they do today. More technological advances made it possible to develop toothbrushes even further, and the electric toothbrush made its way to the United States in 1960. People are still looking to drive toothbrush technology forward. New apps are being created all the time to make toothbrushing easier and more enjoyable. It even looks like built-in cameras may be in the future of toothbrushes! The Toothbrush: One of Man’s Greatest Inventions? The idea of the toothbrush was simple, but there’s no doubt it has greatly contributed to our oral and overall health. In fact, when a group of people were asked which invention they could not live without, the toothbrush beat out the car, computer, cell phone and microwave! So, don’t take your toothbrush for granted. Use it twice daily for a full two minutes!Your pearly whites will thank you. Top image by Flickr user William Warby used under Creative Commons Attribution-Sharealike 4.0 license. Image cropped and modified from original. 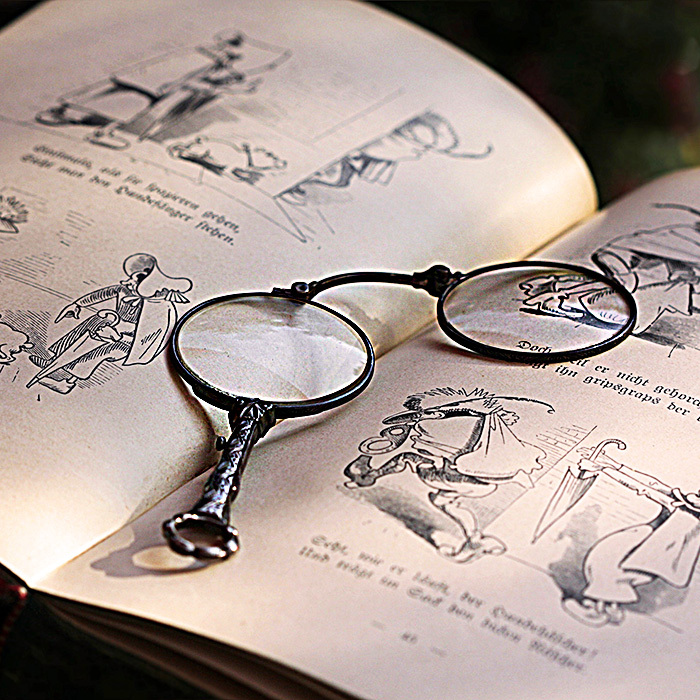 Glasses have come a long way since their inception some time in the 13th century.Join us on a journey through time as we explore the way eyeglasses have changed through the ages! The most iconic piece of eyewear popularized in the 1800s was the monocle(think Mr. Peanut), meant for vision correction in one eye only. Monocle wearers were usually men in society’s upper classes. Women, on the other hand, had their own fashion statements to worry about. And when it comes to eyewear style, nowadays your options are limitless. At our practice, whatever your taste and personality, we have the frames for you.We only carry eyewear of the highest quality. Come explore our collection today! “DO I NEED TO FIX my child’s baby tooth since it’s going to fall out anyway?” This is a question we get asked a lot as dental professionals. The answer is a resounding YES! Primary, or “baby,” teeth serve an important purpose in your child’s present and future oral health. If a primary tooth falls out or must be removed before its time due to decay, the surrounding teeth may shift into the gap, causing dental crowding and future orthodontic problems. In some cases, untreated infections in baby teeth can even affect the developing permanent teeth. Taking care of those primary teeth not only prevents decay, but also helps your child get into the habit of good oral hygiene and sets the stage for their future oral health. Baby teeth may fall out but they’re still very important! Your child’s first dental visit is an important milestone! Children should visit the dentist when their first tooth appears or around their first birthday. A February 2005 Children’s Dental Health Project report found that children who visited the dentist by age one were less likely to visit the emergency room for oral health problems. They also found that children age five who had their first dental visit by the age of one incurred less oral health-related costs than their peers who didn’t see a dentist until age five. On your child’s first visit, we will check their mouth for decay and other problems as well as show parents proper cleaning techniques. Another benefit of early, regular dental visits is that we can determine if a child is at a higher risk for cavities and implement appropriate intervention. Even though they’re temporary, your child’s baby teeth are essential to their growth and development. Teach children to take care of their baby teeth and set them on a lifelong path of good oral hygiene. If you have any questions, call us or comment below! We love our patients and their beautiful smiles! Image by Flickr user Donnie Ray Jones used under Creative Commons Attribution-ShareAlike 4.0 license. Image cropped and modified from original. Eyeliner, mascara, eyeshadow… Makeup can really make eyes pop! Despite the striking effect of beauty products, it’s important to remember that putting anything that close to your eye can potentially be harmful. We’ve compiled some cosmetic safety tips so you can look beautiful AND protect your eyes. For those who are prone to allergic reactions to certain cosmetics, it’s important to introduce one new eye makeup product at a time to your routine. If you don’t have a reaction, go ahead and add another. Be sure to to remember makeup ingredients you’re allergic to and always check labels when picking out a new product. Allergic reactions can cause redness, irritation, swelling or infection in your eyes. So, do your best to avoid them! One of the most serious eye issues that makeup application can cause is a corneal abrasion. This often happens when using a safety pin or other sharp object to separate the eyelashes. It also occurs when attempting to apply makeup in moving vehicles. We all know accidents happen, so it’s best to be as cautious as possible. Unfortunately, infection is a common problem associated with eye makeup. But not to worry, here are some ways you can avoid infection and still rock that smokey eye! Wash your hands. You never want to introduce all that bacteria on your hands to your eyes. Always wash your hands before applying makeup. Don’t use expired makeup. Bacteria thrive in dark, moist places, just like your mascara tube and makeup sponges. The more you use your makeup, the more bacteria you introduce. Be sure to replace makeup every three months. Don’t share. When you use somebody else’s makeup, you’re introducing different bacteria to your eyes that may be harmless to your friend, but damaging to you. When it comes to makeup, sharing is not caring! Get new makeup after an infection. 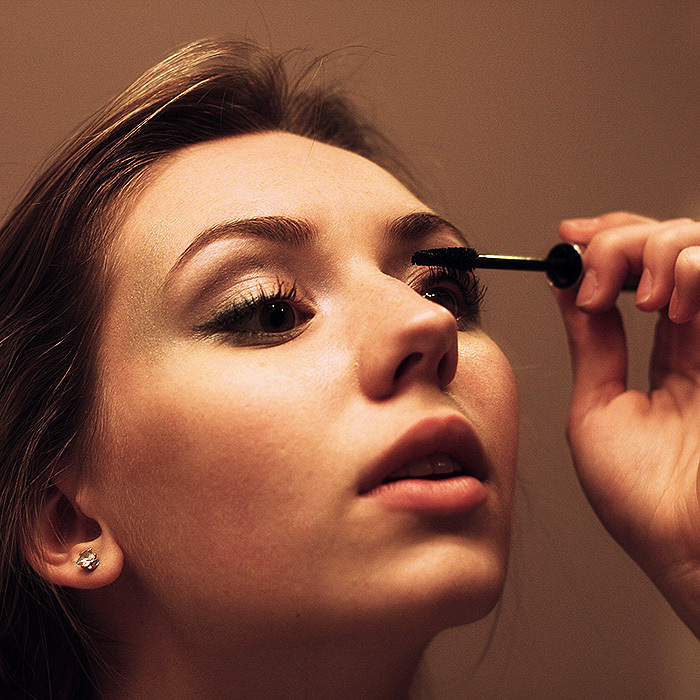 Makeup can be contaminated with the bacteria causing your eye infection. To avoid any risk of reinfection, throw out your old stuff and use it as an excuse to get some new makeup! Eye makeup is one of the most common problems for contact lens wearers. Always remember to insert your contact lenses prior to applying makeup and try to opt for makeup that doesn’t flake, like cream eye shadows. Avoid fiber mascaras as well as there is a higher risk of makeup particles entering the eye. Many makeup wearers who use contacts switch to daily lenses so they can be sure they’re using fresh, makeup- and residue-free contacts. If you’re concerned about makeup and eye safety or have any questions, come talk to us. We’re here to help you know how to protect your eyes as well as beautify them! Image by Flickr user eflon used under Creative Commons Attribution-ShareAlike 4.0 license. Image cropped and modified from original. HAVE YOU EVER HEARD of a person being “tongue-tied” or “lip-tied”? As dental professionals, we care about the health of your mouth as a whole, not just your teeth. When a tongue or lip-tie is present, some problems may arise that we can help with! Why Do Lip And Tongue-Ties Occur? A lip or tongue-tie occurs when a thin tissue in the mouth called a frenum is overgrown. There are two kinds of frena in the mouth, labial (lip) frena and the lingual (tongue) frenum. The labial frena can be found in the center of the lips, connecting the inside of your upper and lower lips to the gum tissue. You can see the tongue frenum by looking in the mirror and lifting your tongue up to touch the roof of your mouth. The purpose of the frenum is to limit certain muscle movements to prevent tissue damage. When the frenum tissue is excessive, however, it has the potential to do more harm than good. What Problems Can Arise As The Result Of A Tongue-Tie? What Issues Can A Lip-Tie Cause? A frenectomy is a simple procedure that can be performed by dental professionals where excess tissue on the frenum is removed. Before performing a frenectomy, several factors are taken into account, including the possibility that the condition may correct itself over time. If you’re concerned about a possible lip-tie or tongue-tie in yourself or your child, schedule an appointment with us today. We’d be more than happy to answer your questions and together, we’ll determine the best way to move forward! Thank you for trusting us with your oral health concerns! The first step toward achieving healthy vision and a beautiful smile is to schedule an appointment. Eye and dental care in one location for you and your family. Save time, feel great, and look good. Our patients love the convenience! Are Sports and Energy Drinks Damaging Your Teeth? 10 Fun Dental Facts You Probably Didn’t Know!